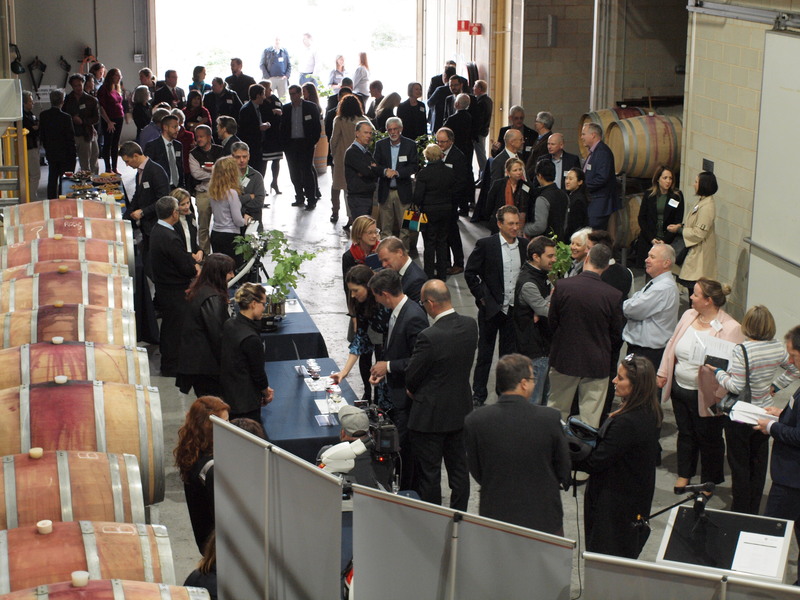 Dispensing with the traditional cutting of a ribbon in favour of flicking a switch on one of the wine industry’s more recent innovations, a crossflow filter, the new ARC Training Centre for Innovative Wine Production (TC-IWP) was officially launched yesterday in Adelaide. 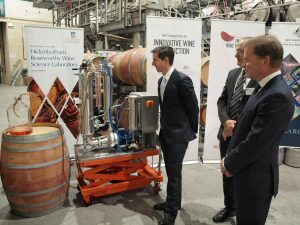 Federal Minister for Education & Training Simon Birmingham had the honour of flicking the switch at the Hickinbotham Roseworthy Wine Science Laboratory at The University of Adelaide’s Waite campus in front of approximately 100 representatives of the Australian wine industry and its research community. Minister for Education & Training Simon Birmingham flicked the switch on a crossflow filter to officially launch the new ARC Training Centre for Innovative Wine Production, watched on by centre director Vladimir Jiranek and The University of Adelaide’s vice chancellor Peter Rathjen. This is the second round of funding the TC-IWP has received under the Australian Research Council’s Industrial Transformation Training Centres (ITTC) scheme which aims to foster close partnerships between researchers, particularly from universities, and industry. The centre received an initial $2.4 million over three years in the 2013 round of funding for ITTCs which supported 18 projects aimed at better managing flavour and alcohol content in Australian wines. The latest round delivers a further $4.5m of ARC funding over five years, supplemented by an additional $4 million in cash and in-kind support from the TC-IWP’s project partners and Wine Australia, which will see the centre undertake 16 new Higher Degree by Research and four postdoctoral research projects aimed at improving the productivity and profitability of Australian wine production. 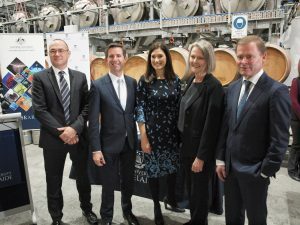 From left, director of the ARC Training Centre for Innovative Wine Production Vladimir Jiranek, Minister for Education & Training Simon Birmingham, Member for Boothby Nicolle Flint (whose electorate takes in The University of Adelaide’s Waite campus), chief executive of the Australian Research Council Sue Thomas, and The University of Adelaide’s vice chancellor Peter Rathjen. The TC-IWP will operate from both the Waite campus and the National Wine & Grape Industry Centre at Charles Sturt University in New South Wales. “I’m thrilled to be able to provide $4.5m in support through the ARC for this new Training Centre for Innovative Wine Production,” said Minister Birmingham. 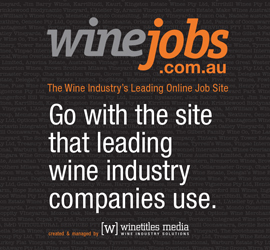 As well as Wine Australia, the partner organisations in the TC-IWP are the NSW Department of Primary Industries, VA Filtration, CSIRO, Pernod Ricard Winemakers, Coonawarra Grape and Wine Inc., Australian Genome Research Facility, Australian Wine Research Institute, E&J Gallo, Chalmers Wines, Charles Sturt University, Availer and Lallemand Australia. 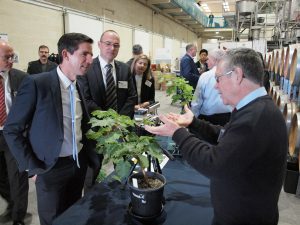 Federal Minister for Education & Training Simon Birmingham talks with some of the researchers behind the projects under way as part of the new ARC Training Centre for Innovative Wine Production. Preliminary evidence on potted grapevines shows that water-stressed vines communicate with their well-watered neighbours and elicit a physiological water stress response. The project will test the hypothesis that during stress or key phenological events (e.g. fruit-set or ripening), source vines emit volatile signals that induce ‘receiver’ plants to respond in kind. Growers may use a handful of source vines, or indeed other plants, in order to manipulate outcomes in nearby vines. This project will define the mechanisms driving xylem/phloem flow in grapevines and show how their close connection dictates water, carbohydrate, ion and signal flow to berries. As grapes ripen, they accumulate sugar via translocation, and a range of specialised flavour metabolites are produced in a seemingly tightly linked pairing. Earlier work on malic acid metabolism suggests a key role for 4-carbon intermediates in flavour compound formation. These will be examined by metabolite and enzyme profiling of grapes from a range of sites in Australia and USA. 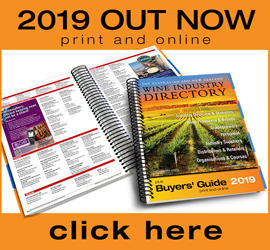 A detailed understanding of the metabolism behind the apparent linkage of these events will help growers develop practices to maximise flavour production without excessive sugar, and hence alcohol, in wines. This project will identify genes from Vitis spp. 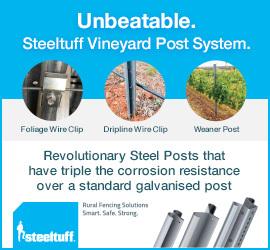 rootstocks that confer salt exclusion in the grapes of grafted V. vinifera scions to accelerate the selection of rootstocks specifically designed for production in Australian conditions. This project will use small interfering RNAs (siRNAs) to artificially ‘prime’ vines to enhance the resilience of vegetatively propagated planting material to environmental stress and to boost infield survival in the initial seasons. This project will develop an in-field assessment of grape quality, composition and fungal taint compounds. Sulfur dioxide is typically used as a control agent against the spoilage yeast Brettanomyces, however, its use has many downsides, including the potential for Brettanomyces to develop resistance. Novel alternatives to sulfur dioxide to manage Brettanomyces, such as RNA silencing, other biological agents (peptides, enzymes) and physical methods of control (low voltage, high pressure, UV treatment), will be investigated. Previous work has shown the effectiveness ofsulfur dioxide is tempered by light and photoinitiators in wine (iron(III), organic acid complexes), which alters wine development during bottle ageing. The impact of these factors on oxidative vs reductive development in wine, and their effect on the consumption of sulfur dioxide and oxygen will be defined to identify better preservatives to protect wine. Field trials in Australian and US vineyards will be used to evaluate sensors/develop methods for monitoring vineyard smoke exposure; identify physiological factors that influence smoke uptake by grapevines; and, building on work in the former TC-IWP, develop strategies for mitigating/remediating the sensory effects of smoke taint. This project aims to understand the chemical and sensorial basis of regional typicity of Cabernet Sauvignon, a commercially-important red variety, and to determine how pragmatic and cost-effective vineyard practices can be used to alter grape composition to meet consumer-preferred wine styles, whether in traditional Western or booming Asian markets. This project will define ways to decrease grape variability via vineyard management practices or post-harvest using efficient berry sorting, and assess the effects on wine quality. Researchers will use blocks of various grape varieties on the same site to define the impact of grape variety on indigenous microflora. Different varieties, phenology, skin thicknesses, etc are expected to host different microbial populations. The project seeks to identify novel strains and improve understanding of indigenous microbial populations used to inoculate fermentations to help winemakers better steer the microbes and fermentation to a desired outcome. This project will evaluate the indigenous microflora isolated in the above project for their winemaking potential (fermentation reliability and novel flavour contributions and produce more robust non-Saccharomyces strains that do not need ‘rescuing’ by a Saccharomyces strain and can make a bigger flavour contribution to wine develop superior lactic acid bacteria for quicker malolactic fermentation. This project will build on knowledge of phenolic extraction to develop dynamic mathematical models for extraction and reaction of phenolics in red ferments. Factors linked to phenolic extraction, mass transport, adsorption and reaction will be considered and lead to predictive tools to guide wine colour and phenolic outcomes, thereby optimising processes and reducing costs. Optimising the depth, shade and hue of red wine colour allows tuning of this important first cue of red wine quality for consumers. With support from commercial partner VA Filtration/Memstar, this project will further develop ultrafiltration technology and its applications to further benefit winemaker.